There is this thing about paper books that you can’t feel with an eBook and makes me still enjoy reading them the old fashioned way, despite the more functional and pragmatic approach of being able to have a whole library in your mobile or tablet. And for us old paper termites, the idea of book sharing is not so appealing, as we get attached to some books despite having reading them more than once. Nevertheless, we have to admit that the upcycling of cute, decommissioned telephone cabins and the concept of social commitment, sustainable consumption and circulatory thinking philosophy behind them, without a credit note, a loan period, nor a fee, is what we need to spread to heal this wounded society. There are several cute book sharing stations like this across the city. They are all solar-powered and kid-friendly. The books are mostly in German, but you could also find some in any other language. 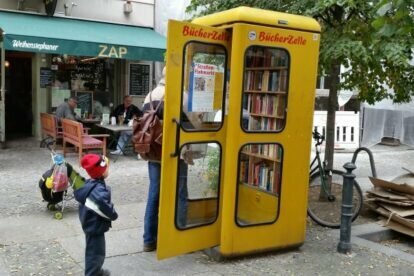 For us, this one just outside biobar Brotgarten, is a good source of bed time reading books for our kids (or ourselves), traveling guides, language learning, kindergarten projects and more.